Looking for a good art show in the city? 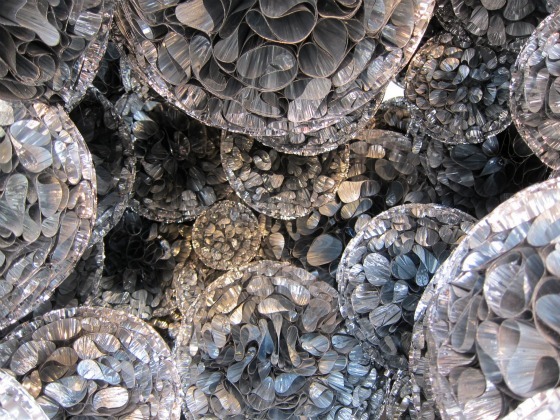 Well, we've got one for you: Tara Donovan, a Brooklyn based artist is showing her Untitled (Mylar) 2011 at the Pace Gallery. The untitled art installation (pictured left) is made out of Mylar: a very thin polyester film that she curled up into massive balls, which if made small, would resemble something more like Christmas ornaments--but Donovan's translation are assembled into massive scales--making them appear more like big mineral rocks. Prior to attaining her MFA from Virginia Commonwealth University, she tended bars and waited tables for about six years. Since then, Donovan has had her work featured at the Metropolitan Museum of Art, as well as at the Whitney Biennial in 2000. In 2005 Pace Gallery became her representative--where her Untitled (Mylar) 2011 is currently on view until April 9th. In the meantime, have a watch at the footage via VernissageTV (below) to get the essence of Donovan's show.